The Harivihar Heritage Homestead is located in the historic Malabar province of Kozhikode (Calicut) in the South Indian state of Kerala, an area once called the “Gateway to India”. 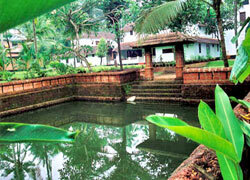 Harivihar, the “Abode of God”, is the former residence of the royal Kadathanadu family. The exquisite estate was built in the mid-19th century and is an ideal place to take a relaxing break, reflect on things in a peaceful environment and rediscover the harmony of one’s own rhythm. Harivihar offers the unique experience of staying in an exclusive Heritage homestead amidst a delightful, exotic landscape. Built in traditional Kerala style, the Heritage home presents itself with a great ambiance and a pleasant, accommodating atmosphere. Harivihar offers outstanding quality in the area of Ayurveda. In a stylish setting, the residents enjoy the soothing, rejuvenating and healing effects of an Indian art of healing that draws its inspiration directly from nature and was brought to fruition by the gurus of a bygone age. Ayurveda guests are looked after by a team of experienced staff members under the guidance of a highly qualified Ayurvedic doctor. Harivihar was awarded the “Green Leaf” by the Government of Kerala, the coveted hallmark of quality for outstanding Ayurvedic services. In addition to Ayurvedic therapies, there are also yoga classes and lectures on Indian wisdom and mythology on offer. Traditional events provide insights into the different styles of Kerala’s performing arts. On excursions in the surrounding area, one can discover and explore the stunning beaches and rolling hills of the Kozhikode region. Every single day reveals why Harivihar is such a popular and relaxing place. 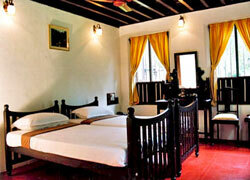 Your stay in this idyllic environment awakens an appreciation of the past and a better understanding of the present. It gives new energy and a positive outlook on the future by refreshing body and mind and getting back into harmony with the rhythm of the universe.